It is a tumultuous time across the entire retail landscape for bricks and mortar stores and the mobility sector is no exception. Despite some of the bigger players in the industry downsizing their physical retail spaces or closing them down completely, such as The Unlimited Company at the end of last year, one retailer that continues to sustained success is Ableworld. THIIS examined what is it about the national mobility retailer that sets it apart in the sector. 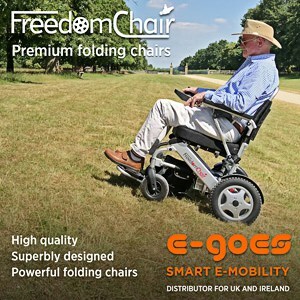 Ableworld is the result of founder and managing director Mike Williams’ vision to deliver a new retail proposition to the market after searching for mobility aids for an elderly relative in the late 90s. The experience left him with an impression of target driven sales people applying pressure to vulnerable consumers and he saw the potential to provide a different retail experience. Launching the company in 2000 and opening the first shop in Nantwich in 2001, Ableworld has grown considerably over the subsequent 18 years, boasting the most amount of mobility retail stores in the UK, with 34 stores across a portfolio of company owned, joint ownership and franchised operations. Discussing the Ableworld retail strategy, Mike explained: “We keep an eye on our competitors’ prices but don’t always try and compete on everything. We have an in-depth range of products on the shop floor – wider than anyone else in the country – and well over 1,000 lines in stock. In particular, Mike highlighted that Ableworld has stayed true to its strategy over the years in the face of retail trends championed by retail consultants, experts and others. “Ableworld do not try to be a ‘boutique’,” continued Mike. “We’re not ashamed to trade in a way our customers have grown up with. Our ego doesn’t stretch to re-inventing the wheel just to keep consultants in employment. The strategy is one that is paying off for the company, with Ableworld revealing in October 2018 year on year sales growth of 14 percent across its own group and 15 percent amongst its franchise group of stores, with projections suggesting overall profits also increasing against the previous year. Unashamedly proud of its approach to retail, Ableworld’s senior marketing manager, Michelle Mossford, told THIIS that together with its retail strategy, the company understands its brand as well and works hard to ensure customers do as well. “The marketing department is always looking to stay ahead of the game and not by copying the competitors or getting carried away with ‘hard sell’ marketing campaigns but by going back to basics and communicating to customers in a way they understand,” she emphasised. Michelle says that it is this customer-centric approach to its activities that is one of the foundations of its success, aligning brand promises with customer expectations and delivering across physical stores, telephone and website. Like many retailers however, Michelle has had to find new ways to engage with local consumers without breaking the bank, with traditional marketing channels experiencing a decline in recent years. “Marketing budgets are linked to turnover and we make sure we are smart with the ways this is spent,” she said. According to Michelle, some of the most successful marketing initiatives for the retailer have cost very little to execute, including the mobility retailer getting national airtime on a popular news station without having to spend a penny. “As a direct result of PR printed in local newspapers and trade magazines, ITV National News contacted us directly to ask if we would be involved in a segment regarding Scooter Safety,” noted Michelle. Working with the community on local projects, sending out press releases to local newspapers and publications and holding events at store level are all key tools for helping promote the Ableworld brand to consumers whilst also helping support and promote other parties as well. This win-win approach to its marketing activities has allowed Ableworld to establish valuable, important relationships with organisations and channels in the communities and areas the company operates in. Ableworld hosts, supports and attends various events at store level throughout the year, forming a vital element of its marketing strategy. One such event the company holds twice yearly is ‘Continence Care Drop-In Sessions’, leading to an increase in continence customers and sales, according to Ableworld, as well as helping the retailer tap into the market of 3.4 million people over 65 in the UK who experience incontinence. Arguably the company’s best-known event is its ‘Scooter Proficiency Course’, originally launched over four years ago with the objective of providing valuable advice and training around the safe use of mobility scooters. Free to attend, the course offers attendees the opportunity to ask questions in an environment that Ableworld says is free from the obligation of having to buy anything. Despite the obligation-free environment, the retailer says following every proficiency course it has ran, there are always a number of sales that are generated as a result of the trust developed between attendees and the company. Combined with its established marketing activities, Michelle and her team have also been experimenting with a new means of engaging potential customers and key target partners via the introduction of its own Ableworld Magazine. Titled ‘Independence’, the magazine aims to provides readers with a variety of topical news, articles and advice aimed at readers, which the retailer hopes will be another differentiator in the market. “Unlike many company newsletters and magazines, ‘Independence’ is about our customers and potential customers, not all about ourselves,” underlined Michelle. “The majority of the content is aimed at providing interesting and useful reading content for customers. Whilst many hospitals and local doctors’ surgeries refuse to take catalogues, a free magazine is a good introduction to the company. As with any retailer in the industry, one of the biggest shifts of the Ableworld’s marketing activity is from traditional medium and into online channels, with the goal of bringing more traffic to its online store. “The increase in digital marketing cannot be ignored, with the main advantage being that a targeted audience can be reached in a cost-effective and measurable way,” said Michelle. Digital marketing allows companies to reach more potential customers at a fraction of the cost of some of the more traditional methods, using pay-per-click, Facebook advertising, SEO and more to drive traffic. Often, the only direct cost to a company being the staff time needed to put together engaging content, manage social media platforms and keep websites updated. One of the natural tensions in the mobility industry is the growth in consumers making purchasing decisions on products solely based on price, rather than the suitability of the product to fit users’ needs and lifestyle, or the aftersales care given. For bricks and mortar retailers, this has resulted in stores having to not only promote their own products but also educate end-users, particularly those new to the industry, into some of the risks of buying purely on price online. It has also led to some bricks and mortar retailers having to make a tough decision about how to respond to the increasingly price-sensitive market and consider matching the practices in order to compete. For Ableworld, the company has not only doubled-down on its digital marketing, but also on its commitment to refuse to sell specific products, such as rise recliners, wheelchairs and scooters online. “Ableworld are proud to be an ethical retailer and at a time when we can regularly lose out to ‘irresponsible’ competitors who have no concerns selling over the internet or without a thorough assessment’, it would be easy to give in,” remarked Michelle, “but for us, it’s about an ethical, professional long-term approach, not about the quick buck today. In a time when many retailers are struggling under this tension between online and offline, Ableworld has cleverly used it as an opportunity to reinforce a message of ethical retail and gain credibility and trust with healthcare professionals, a key target demographic for retailers up and down the country. Alongside a well-defined store strategy and marketing approach, Michelle explained that one of the strongest areas of the business is its stairlift department. Crucially, the company says it invests heavily to ensure it is capable of handling every step involved with the purchase of a stairlift, rather than using third-parties. “Ableworld have a strong stairlift department that look after the customer from quote to install and beyond, carrying out the whole job ourselves. We work in an Industry where helping others is an important factor, so why would we potentially put the customer at risk by passing on a lead or an enquiry to a supplier who could potentially pressure sell and gets the highest price possible?” observed Michelle. Significant resource is spent ensuring its stairlift team are fully trained to carry out basic fault finding and self-help actions if a stairlift stops says Michelle, helping save customers paying a call out fee. Additionally, Ableworld says it prioritises the training of all of its staff to ensure customer queries across all the business can be handled, as well as implementing a customer support system to ensure customers are not left stuck and unable to speak to a real person. “The Customer Services Department have now put in place a call support system so when the store staff are unable to answer a call, they will get transferred to our team at head office, who have been specially trained to be able to help and resolve the majority of calls customers would normally ask our store staff members,” described Michelle. Having invested considerably in its staff, Michelle says employee retention is another important component of Ableworld’s success.